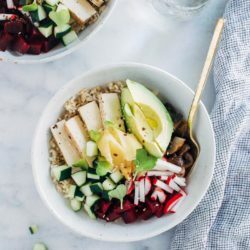 Vegan Poke Bowls- a meatless spin on the Hawaiian classic made with pickled veggies and brown rice. 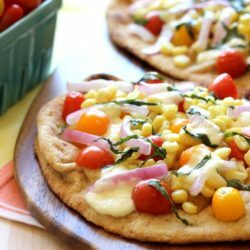 They are light, refreshing, and perfect for summer weather! I wish I had some romantic story from Hawaii to share about my inspiration for this recipe but unfortunately I don’t. In fact, the inspiration actually came from one of the last places you would probably guess…Austin, Texas! During our last trip to Texas, we stopped off for lunch at a super trendy spot in Austin called Flower Child. If you’ve ever been to True Food Kitchen then you would easily be able to imagine this place. It has a fresh, modern feel with a wide array of nutritious options on the menu. Some people might balk at these kinds of restaurants popping up but I personally love them. I don’t care if it’s a chain. The more healthy options, the better! 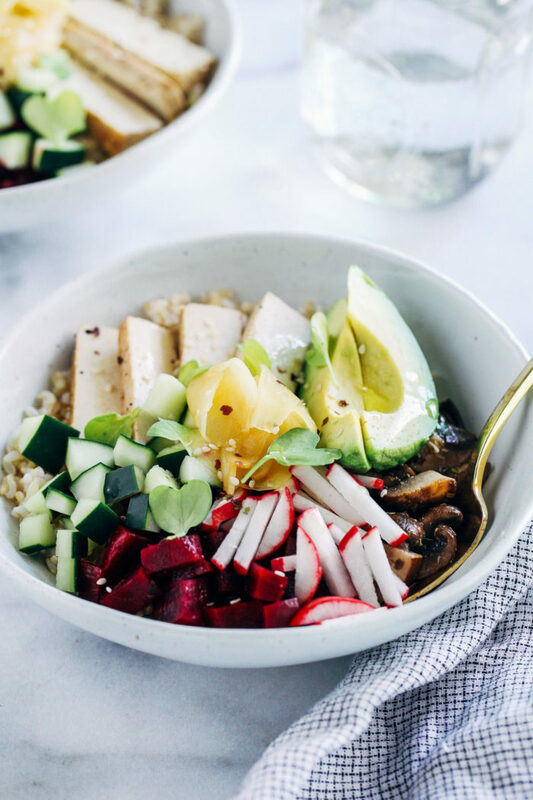 The base of the bowls features a combination of brown rice, pickled mushrooms and beets, sliced radishes, cucumber, seasoned tofu, avocado and pickled ginger. So many stellar flavors in one dish! While it might sound complicated, the recipe actually comes together super quick if you take the time to prep a few of the ingredients in advance. Mainly the pickled beets and mushrooms. Then if you buy frozen brown rice and seasoned tofu (I love this Sesame Ginger flavor), it’s ready to eat in less than 10 minutes. 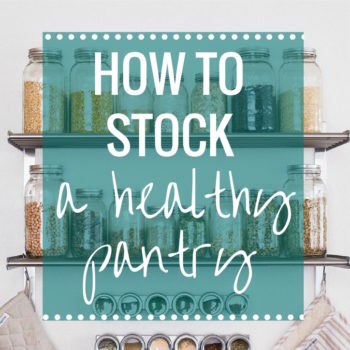 Perfect for when you’re hangry and need healthy food STAT. I hope you get a chance to try these vegan poke bowls because I know you guys will love them. Enjoy! Prepare the pickled mushrooms: warm one tablespoon olive oil in a medium-size pan over medium heat. Add the onion and cook for a few minutes. Add the garlic and mushrooms and cook for about 6-7 minutes, until soft. Remove from heat and set aside to cool. In a jar or bowl (that seals with a lid), combine the vinegar, salt, oregano, and mustard powder. Seal and shake to combine, or whisk well. Add the cooled mushrooms, seal with a lid and refrigerate for at least 4 hours or up to overnight. 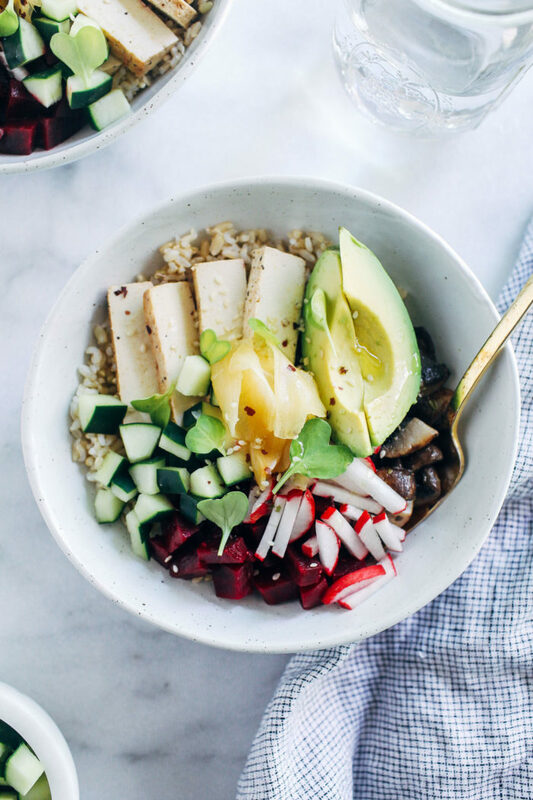 Assemble the bowls: divide the cooked rice among four separate bowls then top with pickled beets, mushrooms, diced cucumber, sliced tofu, avocado and pickled ginger. In a small bowl, whisk together lemon juice and tamari. Pour over top of the bowls, serve and enjoy! 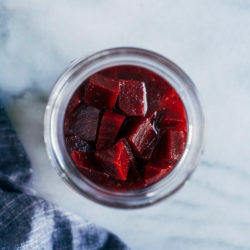 Time does not include preparing the beets or allowing the mushrooms to marinate. If you are planning on having leftovers, wait to add the avocado until ready to serve. 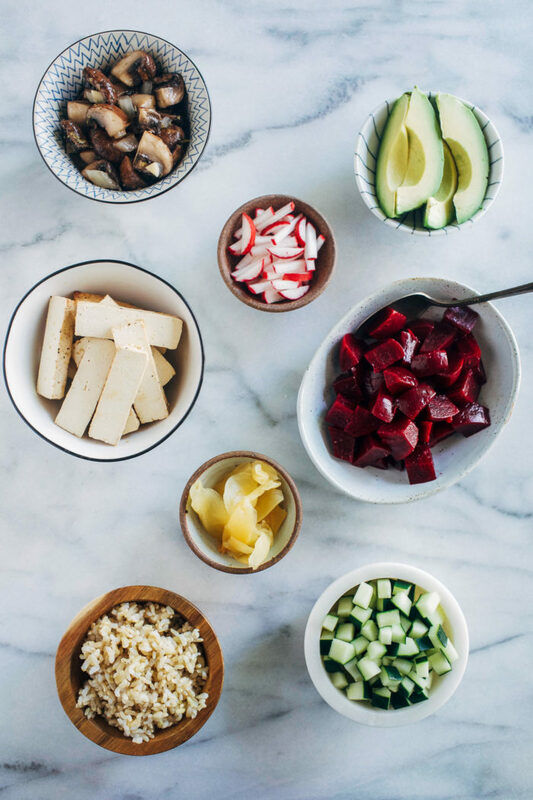 *Pickled beets and mushrooms contribute a lot of flavor to these bowls. However, if you are short on time you can always just serve them with regular cooked beets or mushrooms. 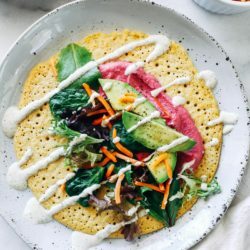 I wish there were more plant-based restaurants where I live. 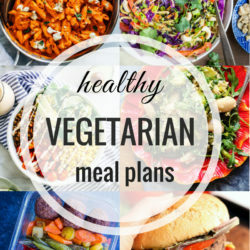 There are a bunch of restaurants that have veggie/vegan options, but usually the majority of the menu isn’t. Eventually the south will get with the times lol. We’re still a bit stuck on our BBQ and fried chicken. 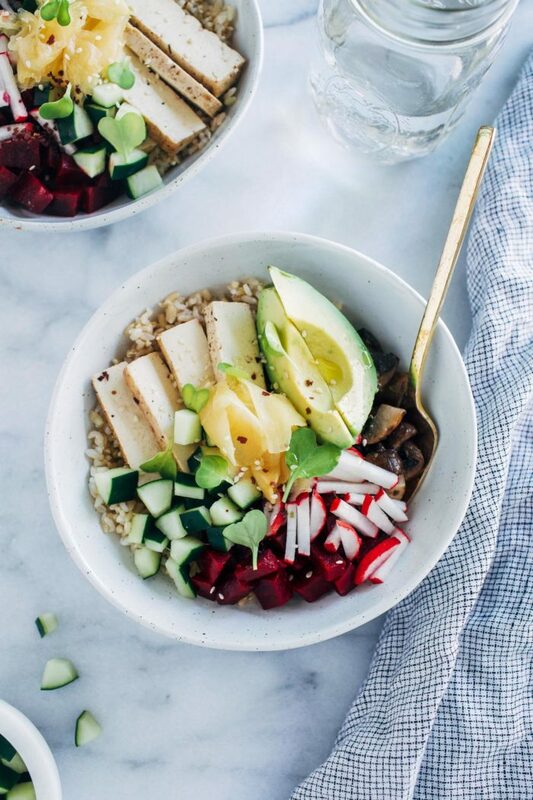 So many flavors and textures packed into one bowl!! If that restaurant is like True Foods then you know I’d love it. 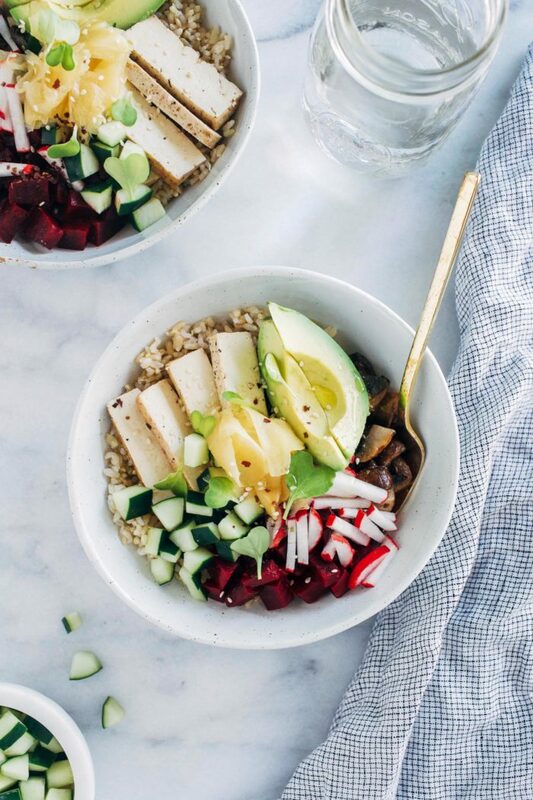 :) This bowl sounds like a flavor explosion and looks so fresh and delicious! I loveeee True Foods! Except the nearest one is five hours away … NOT COOL! :) I so wish they would put one in near us! Or anything like it! ANYWAY these bowls are so fun! I feel your pain- ours is 1.5hrs away! I’m hoping they become more popular in smaller towns eventually. Ok first of all– pickled mushrooms?!? Now these I need to try! I’m not a huge tofu fan but I may just like it if it’s in a poke bowl ;) Very cool idea! 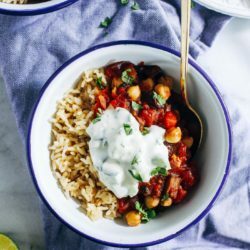 I’m not a huge tofu person either but it’s really good with this recipe! Do you sauté the tofu? I like it if prepared well. But not uncooked.